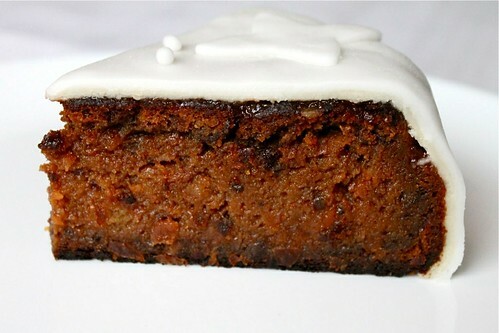 This year I started from the more or less classic Christmas fruit cake, but then I thought of trying something else and made the Black cake (it seems that it is also known as Rum cake), the steamed Christmas pudding. And though all the three are extremely beautiful the Black cake feels most urgent to write about. I happen to be a first texture then flavor person and this might be the reason why I so much prefer Black cake. It is moist. The fruits are processed, so there is no bite. Only melting blackness. It feels light and dense at the same time. It looks luxuriously dark under its white icing blanket. The blackness comes from dark rum, dark brown sugar, molasses and prunes. And its flavor is no less sophisticated than all said about it already. 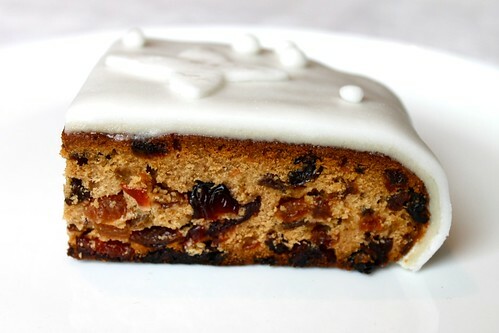 Classic Christmas cakes (picture above) are normally made the following way. You soak mixed fruits overnight in brandy or other flavorful spirits. Next day you prepare cake batter (with flour, sugar, eggs, butter etc as well as Christmas spices) and mix the soaked fruits in. Then you bake. And then you pack the cake airtight and let it mature at room temperature for about a month. This month is exactly when all the flavors from fruits, brandy and spices can marry and get fully absorbed by the cake. It's not that it tastes bad right after baking. But it is nowhere close to that magical sophistication it reaches with maturity. Black cake is made in a different way. You start from processing the fruits to almost puree and soaking them in dark rum. Then you let them marinade for at least two weeks and at most six months before adding them to the cake batter. I did three weeks this time and would love to try six months next year. In any case though, the flavor of fruits and alcohol inevitably changes a lot during this period and it seems to be the key to all the difference in how the cake tastes later. Though the process from start to end seems long (you have to start at least five weeks before you want to eat the cake), it isn't actually at all difficult or time consuming. You soak the fruit, set an alarm in your calendar for the next month and forget about the cake till then. You bake, pack and forget again till you want to ice it. Then you ice, slice and done - you make yourself a cup of tea and bite into. The recipe calls for molasses (picture above), natural vanilla extract, marzipan and ready-to-roll icing (сахарная мастика). These are now quite easily available in Moscow from online stores. I use this one, but I don't insist it's the best one. It might seem that making two big cakes as suggested by the recipe is too much. 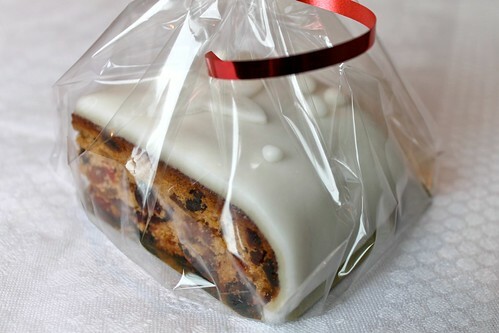 However this kind of cake is that stores safely for months, never bores you and a nicely packed piece of it serves as a lovely little Christmas present for anyone you'd like to greet. You are more likely to regret making less than more. Start at least five weeks (up to 6 months) before you plan to eat the cakes, i.e. somewhere around the middle of November. Process the fruits in a food processor till you get very small pieces, but not puree. It is better to do one fruit at a time, so that they don't get crowded. Place the processed fruits in a large airtight plastic container (should be around 2.5 liters in volume). Pour in Madeira and rum. Give a little stir. Put the lid on. Leave to marinate at room temperature, away from light (dark colored plastic bag may be useful here) for two weeks to six months before you move to baking the cakes. At least 3 weeks before you plan to eat the cakes, bake them. It is better to first make the batter for one cake and bake it. Then repeat the process with the second cake. In an ordinary home oven you will hardly be able to properly bake two cakes simultaneously. And given that they bake for a long time, mixing the batter in advance won't work too. Preheat the oven to 175C (350F). Line a round spring form or cake pan 22-24 cm (9 inches) in diameter with two layers of brown paper / any wax paper. Then line with one layer of baking paper. That many layers are needed to prevent the cake from scorching. To make the batter, cream butter and sugar. Beat in the fruit and rum mixture. Add the vanilla, nutmeg and cinnamon. Beat in the eggs. Stir the flour with baking powder and add to the batter. Stir till everything is just combined and there are no big lumps of flour, but no longer. Stir in the molasses. Bake at 175C (350F) for 1 hour. Reduce the oven to 160C (325F). Cover the cake with a sheet of foil or baking paper (to save it from burning) and keep baking for 1 - 1.5 hours till a wooden stick inserted in the middle of the cake comes out clean. Take out of the oven and let cool to room temperature in its pan, on a cooling rack. Take the cake out of the pan, remove the paper. Pack the cake in several layers of plastic wrap or in an airtight container. Leave to mature at room temperature, away from light (dark colored plastic bag may be useful here) for three to four weeks. Before serving, ice the cakes. Unpack a cake and set it on a serving dish. Heat the marmalade. If it has any solid fruit pieces in, either process or strain it. Brush the top and sides of the cake with marmalade to make it wet and sticky. Dust your working surface with icing sugar and roll the marzipan around 3 mm thick. You need to get a round large enough to coat the top and sides of your cake plus extra 3-4 cm. Cover the cake with marzipan. Press the marzipan slightly to make sure it sticks to the jam and there are no air holes. Trim the excess. Dust your working surface with icing sugar again and roll the icing the same way as marzipan. Slightly brush marzipan with cold water and cover with the icing. Press the icing down to make sure it sticks to marzipan. Trim the excess. Roll the remaining icing and cut out some leaves or other shapes of your choice. Brush slightly with cold water and place over the cake. Roll little "berries" with your fingers and sprinkle over the cake. Now it's ready to be sliced and served. 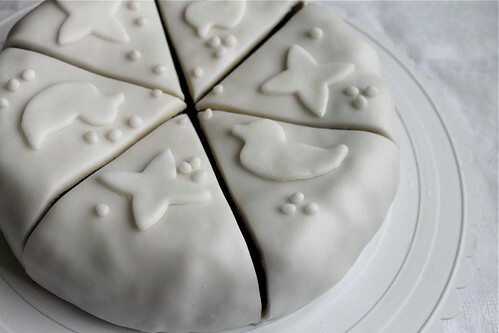 If you want to make the slices look perfect, use hot knife and clean it after each slice.